Discover how to cook with essential oils for taste sensations you’ve never experienced before. We all use dried spices that are from the same natural plants created by mother nature. However, being dried, they tend to lose their flavor over time. I grow my own Basil, Sage, and other herbs that I cut and use fresh from the plants that are much more flavorful than those dried in a small bottle from the grocery store. Find out how to stir up creations in your kitchen with some basic recipe ideas shown below, considerations about other issues that essential oil lovers wonder about with the top essential oils used for cooking. Read more about essential oil safety and ingestion. Ancient people and people today mix nature’s herbs and flowers with its long-standing history for flavor and nutrition. Garlic for instance, is an herb so healthy for you along with other members of the allium family. Allium is Latin for garlic and there are hundreds of species of the genus of monocotyledonous flowering plants. You know most of them being onions, scallions, shallots, leeks, and chives. I have wild onions growing in my grass and they do not die with weed killers. The tiny bulbs are deep into the dirt to plus 5-inches, so I pull them, wash them, and cook with fresh green beans. The flavor is light and mild, and our ancestors ate them for years. They are also delicious with dandelion greens dug up at first sight before old and bitter in the spring washed about 3 times in salt water to remove bugs and cooked in 2 pots of water to remove the bitter taste. Add a little apple cider vinegar and a ham bone if you are a meat eater. Ingestion of essential oils is quite controversial since becoming so trendy by essential oil diffuser users. Aromatherapy has miraculous effects on our health, mind, and spirit. The benefits of this aromatherapy can be obtained with the essential oils that are derived from nature’s plants—flowers, leaves, rind, fruit, bark, roots, seeds, and stems. With that you will have the best fragrances for your well-being and health and tasty foods as well. With that being said, some oils are great for flavoring foods and drinks. There is nothing new under the sun and what was once done is done again and again through all civilizations. Even the Egyptians had electricity and did brain surgery! Do not use fake essential oils, synthetic oils, flowered waters, or other pretend oils. You do not want to ingest the chemicals in phony products. Of course, sellers will tell you they are authentic because they want to make money on imitations. Cooking with essential oils is not new; however, do not ingest them straight from the bottle! They are very potent. With so many opinions out there, what’s a person to think and do? History tells us that they have been used forever, so it’s not a new thing to do. Flavoring has been used for years and we use vanilla extract for our baking goods. The imitation is not good, but the 100% pure extract made from vanilla beans is a wonderful taste sensation. When you cook with essential oils safely, you will immediately notice the difference between dried spices and even the home-grown herbs because you will be tasting the pure essence of the plants. Essential oils can taste better compared to the dried varieties too. Everything in life should be done in moderation. Many times less is more. You can overdo adding essential oils to your recipes and can become ill. The components are stronger than in dried spices or the leaves of a Basil, Sage, or Tarragon plants for example. Be sure to note the differences in taste and use accordingly. You will need to know about each oil you plan to use, precautions, and a summary describing them. Always error on the side of caution. With your knowledge, you can proceed with cooking safely and having fun at the same time. Foods can be more flavorful—or not. Too much will ruin a dish. You can always add more yet cannot take it away. This reminds me of making something with too much salt: I could never get the dish to be right even when adding the same ingredients times two. As you know from reading my articles, essential oils are the pure strong essence of the plant, tree, or whatever part was used to create the oil. There is no exact method for determining what would equal a teaspoon full of a spice in dry form for example, yet we do know that you will use a smaller amount of essential oil to take its place. The quantity would be one drop of essential oil as a substitute for a teaspoon of a spice or fresh herb from your garden. Remember that you can always add another drop but not take away too much added. Your essential oil recipes should be reduced from their pure strength into an oily form to mix with your ingredients. When you dilute the essential oil with a small amount of Olive Oil, Coconut Oil, Avocado Oil, or other oil, mix in a cup and then add to your food being prepared for the best flavor from the oil so that it is mixed for the entire skillet or pot of ingredients you have cooked. Do not use oils that are made to blend with essential oils; use cooking oil types. Coconut oil will be hard and you will need to melt it first to mix with your essential oil for cooking. Only use food grade oils for mixing with your essential oils and not carrier oils. If you’re making baked goods or something sweet such as homemade applesauce or pie fillings, honey, sorghum, or pancake syrup will work for you to mix with essential oils. If you have prepared a hot recipe, it’s best to wait until the food has finished cooking because the essential oils are unstable, often called volatile. Volatile also means they are explosive, but not to worry about that unless you light them with a flame. I use the word unstable since they can lose their valuable chemical properties from heat. When you’ve cooked a stovetop recipe, wait until the food has stopped cooking and not boiling. Let it rest as you do with your Thanksgiving turkey before carving it; then add the essential oil. With your baked recipes, you will probably lose some of the chemical properties through the process of the hot oven. When you dilute the essential oil first, you will be able to preserve the essence better. I think you will still be happy with the flavor from the essential oil even if it is a tad pushed back in flavor; the flavor will still be there however. There’s nothing that tastes better than a cheese and potato bake with spices unless its Italian food loaded with basil that loves tomatoes. It’s important to know that two chemical actions occur when using heat for cooking. One is altering the chemical properties of the essential oils and the other is evaporation. However, don’t let these two things stop you from enjoying your gourmet cooking delights. When you add the oils diluted to your food last, you will reduce the effect of evaporation with the right amount of dilution. Try using one drop of essential oil with a tablespoon of olive oil or other flavor, mix together in a cup, and stir into the food. For the best final flavor, always buy the best tested and certified essential oils such as the 10 popular brands I reviewed. To answer the question, Does cooking destroy the benefits of essential oils?—the answer is probably some value will be lost. In spite of this, just know that you do get to enjoy the aroma, the flavor, and the great food dish. If you want to enjoy the most healthful benefits from the oils other than cooking with them primarily for flavor, use them in your diffuser or mix with a carrier oil for a relaxing massage. Add one drop of Red or Black Raspberry Seed Oil to a tall glass of iced tea. This is my favorite flavor for summertime iced tea. Get yourself a box of food grade essential oils to try different flavors in all you cook and drink. Here’s a great Plant Guru® kitchen variety pack to get started with. Using only one drop of Vanilla is wonderful in a Coke® or Pepsi® over ice. The set includes spices and herbs most often used in our kitchens. Add one to two drops in your sweet baked goods from the spice flavor and the same number of drops for that savory flavor everyone loves in your cooked roasts and other dinner dishes and onto raw salads, veggies, and fruit. In alphabetical order are the most often used essential oils in the kitchen. Illicium verum is a medium evergreen tree native to Northeast Vietnam and Southwest China. If you like black licorice, you will love Anise that is lighter and sweeter and one of my favorites. It is used in cookies, biscotti, marinades, soups, sausages, Asian foods such as Vietnamese, Chinese, and Japanese, and other ethnic recipes. It’s one of the signature flavors in the Vietnamese noodle soup phở, with chicken or beef and noodles originating in Hanoi, Nam Định Province, Vietnam. The soup is time consuming to make with 8-hours for the clear broth and is available at restaurants here in the USA and globally. Try some; you’ll love it! Use two drops of Anise, Coriander, Cinnamon, and Cardamom essential oil and other spices in place of the dried or fresh spices. This is a long video of about 13-minutes and so interesting to watch! Being similar to Fennel with its digestive benefits, Anise can be replaced with Fennel in recipes. Both Fennel and Anise can be dangerous if used each day and in large amounts. A drop will do in your baked goods. Anise contains the chemical estragole so use it judiciously. The methyl ether of chavicol (estragole) occurs in the essential oil of Tarragon and Basil, is in turpentine, and used in perfumes. Years ago Sen-Sen Anise candy was made, and they were one-quarter-inch thin tiny square flat flakes. They were delicious then and no longer manufactured; many of us wish they would come back. Pluses of Anise are its digestive value. Go easy with it in your Anise biscotti a taste sensation to die for! Next to raspberry in my tea, Cardamom adds a sweet soft pleasant taste that I love. I use it in my winter time hot tea. And it smells good and it’s amazing in baked goods such as zucchini bread, cakes, and more. As a spice, it can be purchased as whole seeds inside its pod or as a ground powder. I think you will notice a more dynamic flavor using the essential oil. It’s excellent with cinnamon for Chai tea and is great in savory meat and vegetable dishes too. Pluses of Cardamom are digestive wellness, eliminates nausea the same as ginger does, and it’s an antioxidant. Cinnamon comes in several forms: Cinnamon Bark and Cinnamon Leaf. I like Rocky Mountain Oils™ essential oils for this spicy flavor and aroma and the fact it comes from Madagascar. This is a very strong oil and irritates mucous membranes so mix with Olive or Coconut oil when adding to cooked or baked goods. One drop is sufficient for a recipe and is better tasting than the ground spice. The cinnamon derived from the plant’s bark is especially delicious in cakes, pies, and sweet breads such as banana and pumpkin. It’s great in French toast and iced Cinnamon sweet rolls for breakfast. Pluses of Cinnamon are its antioxidant capabilities to reduce free radicals and antimicrobial effects, it’s stimulating and energizing for all of your senses. Citrus fruit are many—Grapefruit, Mandarin, Tangerine, and Bergamot that is a Citrus as well. The Plant Therapy® set below consists of Grapefruit, Tangerine, Lemon, Mandarin, Lime, and Sweet Orange. This set is great for desserts and main dishes to enhance the flavor and is affordable as a complete kit of Citrus flavors. This brand is kid safe. All of the Citrus essential oils are excellent for baked goods and adding to drinks! They are pressed from the peel of the fruit rather than the twigs, leaves, or seeds of the fruit. This gives you the authentic fruit taste you’re so accustomed to eating. Since these are not steam distilled, they will be exposed to heat for the first time when you cook with them using heat. So expect a diminish in flavor—maybe, yet this taste is still scrumptious. You can use all Citrus essential oils in smoothies, orange-cream shakes, stir fry veggies with meat or poultry, casseroles, one-pot dinners, and even dips for your corn or potato chips. Pluses of Citrus are the crisp acidic flavor and they are a great detox for your body with energizing benefits, are antimicrobial in composition, and just might help you lose weight. 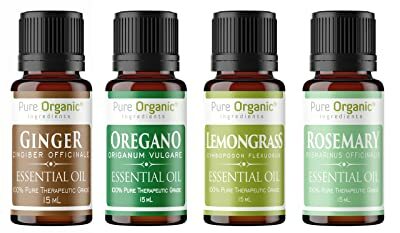 The Pure Organic™ essential oils are available in a 4-set with savory flavors for your meat and vegetable dishes. I don’t think many people are aware that these oils can be used for cooking: Ginger for baked goods, Oregano, Lemongrass, and Rosemary for savory flavors in main dishes, meat, poultry, and fish. A drop of Lemongrass in tea is excellent and Ginger pairs up with your baking flavors of Cinnamon, Ginger, Allspice, and Clove. If you cannot find some spices in essential oils, use your jars or tins of ground spice instead. Pluses of the savory herbs enhance food flavor, aids in digestion, a powerful antioxidant for your entire body’s detoxification, and reduces tooth ache pain. By the way, Allspice (Pimenta dioica) is a spice in itself, not all spices in one. It is steam distilled from the berries of the Allspice fruit on the Pimento tree. This is used for digestion; the smell is heavenly warm and fragrant. The flavor of Allspice is wonderful and can be used in mincemeat, pumpkin pie, soups, stews, sauces, gravies, stuffing, curries, preserves, relishes, pot roasts, cakes, cookies, puddings, cocoa or chocolate dishes, in beef, ham, veal, or chicken dishes. The Plant Therapy® Allspice brand is a top seller on Amazon.com® with many stars and excellent customer reviews. I happen to love this brand myself because of its pure aroma and authentic flavor. I grow this plant for the leaves that are known as Cilantro known as Mexican parsley and Chinese parsley. The top will send up tiny white flowers that turn to seed in the fall and that is Coriander a different spice with different uses. So, for Cilantro that you either love or hate—there is no in between—with its slightly soapy taste. I love it and use it in my Mexican green chili with pork, burritos, salsa, and anything Mexican. With the fresh plant, I don’t wait until it matures to seeds, I use its feathery leaves and chop into my food while fresh. Cook it in your taco meat using one drop of essential oil when you don’t grow your own or don’t want the old Cilantro from the grocery store that has very little flavor. Add goat cheese, jalapeño pepper, and enjoy with Mexican carne asada. Simply mix one or two drops with the larger food you are cooking blending it with Palm, Sunflower, Olive, Coconut, or other cooking oil then add into the food you’re cooking. Pluses using Cilantro are the digestive and antioxidant benefits. Coriander seeds are ground into a powder as a spice and is a sweet and spicy, slightly fruity, herbaceous, and warm used by the people of India for curry with turmeric, and other spices for delicious veggies and meat. Coriander does not taste like the plant it made its seeds on—Cilantro with lacy leaves. Put one to two drops in your dishes of the Coriander essential oil for an exquisite taste sensation. You will like it better than the ground up form. Coriander was used by the Egyptians and Greeks and the pharaohs in Egypt were buried with Coriander seeds. The food at the left is potatoes, meat, curry, spices, and Coriander a delicious India dish. Coriander blends well with baking sweet treat flavors of Cinnamon, Ginger, Citrus, and Neroli. Coriander is delicious in vegetables, sauces, pickling, and any savory recipe calling for herbs. Pluses for Coriander are its digestive and antioxidant benefits. From Sri Lanka, the Edens Garden® Ginger is good in gingerbread and ginger snaps that you make yourself using one to two drops of the essential oil. When baking cookies, cakes, breads, or pie fillings calling for Ginger, this is the one to use for the gingeriest flavor. Add it to spiced drinks, sauces, oriental stir fries, and marinades. Of course the best Ginger is the root from the produce section at the grocery store that must be peeled and thinly grated to add to your dishes. So why bother? Use this quick essential oil for that intense Ginger flavor you love. Pluses of Ginger, similar to Cardamom, is even better for getting rid of nausea, yucky stomach feelings, and is an autoinflammatory. This is a favorite essential oil for everything from diffusers to massages and simply wonderful for the light floral taste it provides in recipes. This is probably the best one to start out with since it gives a delicate light taste sensation. Try it in apple pies with Cinnamon and other sweet spices and it’s tasty in iced cold lemonade homemade of course from real tree lemons, not the fake stuff in boxes. If you make a simple syrup of white sugar and water for your pancakes, try adding one drop of Lavender to see how everyone likes the subtle taste difference not being so sugary. Lavender is excellent with fish dishes whether fried crisp, baked, or grilled outside. It is excellent in baked goods such as cakes, pies, scones, cookies, and flavored breads. Pluses of Lavender are relaxation, calming anxious feelings and anxiety, plus it helps you sleep. This is another favorite to start out with being cool and refreshing. Add a drop to your mug of tea whether hot or cold for a minty delight. It also blends great with Lavender for a tall cold icy glass of lemonade. Bake up some Peppermint chocolate brownies or cake with Peppermint frosting. Add a drop to homemade candies too. Your kids will love it! This brand is natural, food grade, and kosher. It’s great to use for your own oral health as well, which is not cooking, but a good practice to have. Pluses of Peppermint are energizing, stimulating, uplifting, relief from aches and pain, and better athletic accomplishments. 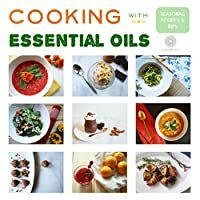 For more recipes using healthy essential oils, I suggest this book, Cooking with Essential Oils: Seasonal Recipes & Tips, Kindle edition or paperback. When used in moderation, essential oils can add extra flavor and health to your food. This book includes 10 different recipes that incorporate essential oils. Organized by Ayurveda seasons of spring, summer, fall, and winter, the recipes focus on healthy plant-based eating using fresh, seasonal ingredients. There are also basic guidelines for using essential oils in recipes and mouth-watering colorful pictures of each dish. The 100% pure essential oils that you use for aromatherapy with a diffuser or massage lotion are the same ones you use for cooking. Remember to use caution because some people are sensitive or even allergic to these potent oils from nature. Consult with your doctor if you are pregnant or breast feeding, a child or elder. There’s plenty of information to research on the Internet. You can always check with a certified aromatherapist for your concerns. Feel welcome to leave a question or comment in the section below. Be healthy, happy, and try cooking with essential oils.